I didn’t have time for a new or good post today, so instead, I unproudly present a Moldy Oldy from the long forgotten year 1999. 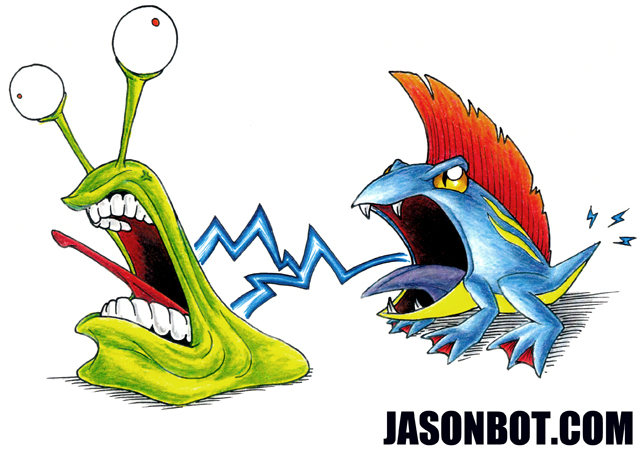 You have to understand something–this was drawn in early ’99, before the Digimon anime came to the states. This was back when Digimon were “those things like Tamagotchi, except they fight and stuff.” And you’re saying, because you’re a confounded toddler, “WTF is a Tamagotchi?” To which I respond: GET OFF MY METAPHORICAL LAWN, YOU DAMN KIDS. I forget the names of these two Digimon, and it’s late, so I’m too lazy to look it up. Also: I don’t recall what kind of reference material I had to go off of (the internet was pretty shaky back then, y’all), so I can’t vouch for the accuracy of my renderings. Please don’t interpret this as a callous attitude towards Digimon–I actually love Digimon, particularly season 2 and 3 of the cartoon (AKA Digimon Adventure 02 and Digimon Tamers). I’m just too tired to dig up my Digimon book right now. Yeah, I have a book, SO WHAT? < Previous Leftover Commission! SPOOON!! !